Mattie Ross is a plucky 14 year old girl who goes out in search of Tom Chaney, the murderer of her father. She ventures out to the wild Choctow Nation with the help of two rangers to avenge her father's death. 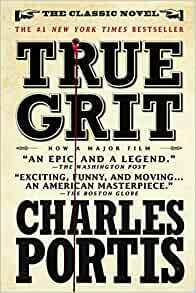 True Grit is the story of a young girl's persistence, strength, and love for her father. This book was great because Mattie never lets her age stop her from avenging her father. The book was definitely enjoyable, but it can drag on towards the middle and be a bit difficult for younger readers to understand. I would recommend this book to older readers ages 13 and up. It's a great read for people who enjoy reading about adventure, the Wild West, and a spunky main character.